[NOTE - this is one of TWO IDENTICAL CONDOS we have in the same building (1 floors apart). If unavailable for the dates you desire, check the other listing: HomeAway/VRBO #921061]. Centrally located at the heart of the financial and entertainment district in Downtown Toronto core. Steps away from Rogers Center, CN Tower, Metro Convention Center, Air Canada Center, Harbor Front Center, Billy Bishop Toronto City Airport. Fully furnished private suite for one or two families. 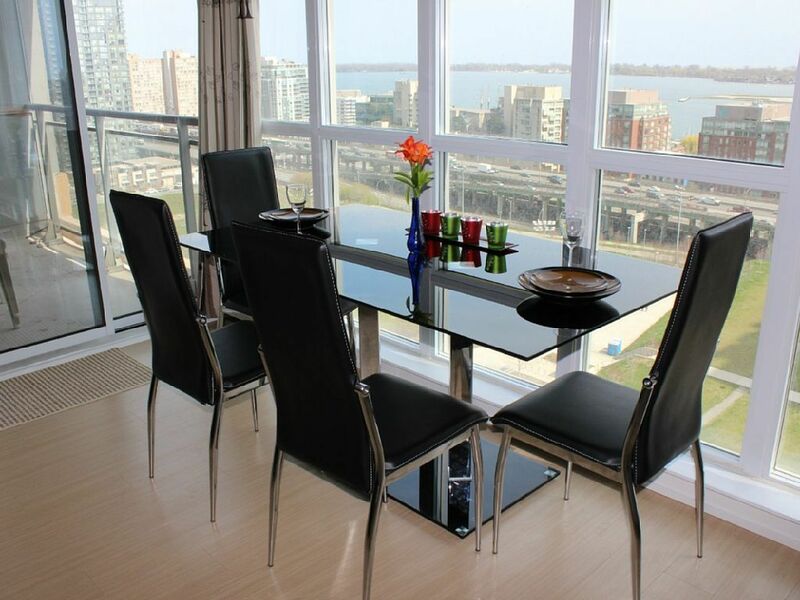 18th floor, with an unobstructed view of 8 Acres Park & a spectacular panoramic view of Lake Ontario and Toronto skyline. Floor to ceiling windows, facing south in both the living room and master bedroom. * Printer and Scanner included. * Patio furniture for your enjoyment. Free access to club amenities, such as Swimming Pool/Spa, Fitness Center, Billiard, Ping pong, Squash court, etc. Nearby grocery stores; Sobeys just 200 meters away. Managed by the homeowner directly. No matter for what kind of reasons you visit Toronto Downtown, it is the best place you can stay. Beautiful view, clean accommodation with all necessary supplies you may need. Easy check in and out. Don't forget, it is managed by the owner, whom can be reached 7x24. We provide two sets of cleaning towels, two rolls of bathroom tissue, one box of facial tissue, hand cleanser, shampoo, hair conditioner and Shower gel for each bathroom. Very comfortable, everything is close by, we enjoyed our stay & will definitely do it again when returning to T.O. We really enjoyed our stay here. John met us at the condo to show us around and explain how things work. (The building is very secure!) The condo was surprisingly quiet--no noise within the building and only occasional street noise. There's a nice view of the lake and the Billy Bishop Airport and most of what we wanted to do in Toronto was within walking distance. A secure, covered parking space was a bonus. The kitchen has adequate dishes and pots/pans. It is minimally equipped for other cooking/baking. There are countless places nearby to eat, including a Tim Horton's across the street where you can pick up a quick breakfast, and there is a large grocery store just a few blocks away. We're happy with our stay here. We stayed for three nights in October in this great apartment. It is ideally suited for two couples with two bedrooms and two bedrooms. There is plenty of space in the living area which includes a small balcony. There is a lovely view over Lake Ontario. The apartment is very well equipped and had everything that we needed. John was very helpful, personally directing us to the parking space in the basement garage when we arrived. There are a number of bar/restaurants and a grocery store within a few minutes walk of the apartment. It is a nice area and everyone was very friendly. It is possible to walk from the apartment to see many of the tourist locations. We really enjoyed the great view of the lake from the window in the dinning area and the patio. My daughter and I began researching condos in Toronto that were in our price range and had two bedrooms and two baths. We reviewed the sites offered on the Home Away based on the fore mentioned criteria where we found this unit. I was very pleased with the communication between myself and the condo proprietor from the outset of agreeing to the contract to our arrival on site. All transaction between both parties was handled in a very professional manor. When we arrived at the condo we met up with John in the lobby. He took me and my son and law outside to show us the lock box and the combination code where we would put the keys and fob when we ended our stay. He than instructed us how to maneuver through the parking garage to the designated parking spot. Than how to use the fob to get to the 18th floor on the elevator. Than he walked us in to the condo where he showed us how to operate the TV and pointed out the instruction notebook with contact information. The property locates in the center of the Toronto Downtown Entertainment district. You can walk to the most famous attractions Toronto, such as CN Tower, Ripley's Aquarium, Metro Convention Center, Roger Center, Air Canada Center, Harbor Front Center and CNE etc.